I admit it. I’m a recycling geek. Wherever I go, I check out the trash cans and recycling bins. During the past several months, I’ve done a lot of traveling. Sometimes, I’m at recycling industry meetings. At those, I look to see if they recycling bins look permanent or whether they were just added for our benefit. At airports, I’m fascinated by signage and lids. Is it easy for people to figure out what to do? And, yes, I look into the containers to see how well recyclables are being separated from trash. In airport restrooms, I’ve noticed lately that sharps disposal containers are readily available and appear to be easy to use. At hotels, I’m curious about whether recyclables left in the room will be handled properly. On college campuses, we’ve seen a range of programs. I’ve been particularly fascinated by the cafeteria recycling and food waste composting programs, which often feature “how-to” bulletin boards. And there’s more. Driving around unfamiliar cities, I check out the various trash cans, recycling carts, and other containers set out at the curb. Which container is largest? Where do folks seem to put the carts on non-collection days? For over 20 years, I’ve been working with communities and helping them communicate about their recycling programs. I suppose this is an occupational hazard. But it is also interesting as a cultural and anthropological exercise. What we do with our waste says a lot about us. How we choose to contain our discards says a lot about what we choose to waste and what we choose to value. 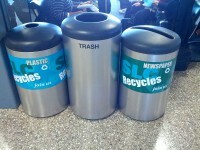 So, yes, if you see a woman taking photos of recycling bins at the airport, it might be me.